Be of higher mind, and imagination. You have to realise your power and be generous with it. To be, think and do for the highest good of all, will reap rewards now on a planetary level, and this moon is the planetary tone of manifestation. Sow the seeds, they will almost instantaneously appear as shoots, unfurling like a quickened time lapse photography scene. The fruit will come early, but do not pick it until just on ripe. Not too early, but don’t wait too long. If you have cars, watch for repairs, and upgrades are good. Give old clothes and things away, and know that you have the freewill and freedom to rebel and revel. Scantily clad, simply means not wasting time and money and effort on superfluous frills and flounces when the natural beauty of something needs no extrovert garnishee. Indeed, the plain and simple yet vibrant colour of the weave and the cloth show the iridescent illumination of the soul. Choices made during this next 20 days, will reflect upon your soul like never before. Stand up and be counted, be heard and be seen. As we head toward the spectral moon of liberation, we must unbind the mummy and let her speak, the matriarch will be unbound and unwound, the patriarchal will have to sit down. Cruelty in this dimension will die with those whom linger, and the spell of delusion will quickly fade from view. A reality check will be the pattern of the clothes, the tweed of old glory will make way for the multidimensional chess board pattern, checkmate says the queen ! 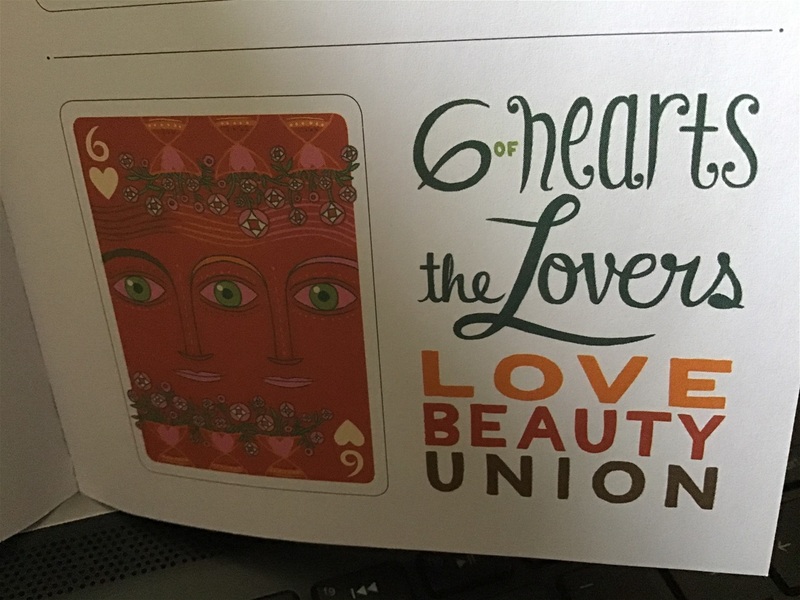 The key is in the heart, deeply embedded like the sword in the stone, the Queen of Clubs, wields the Ace of Swords, and hearts and diamonds will follow. The magic wand is yet to be revealed. How to make pentacles count and how to count the pentacles, leading us into the land of plenty for all and all are one. Find your rhythm, you have time. Dance to your own tune, the beat of your drum and wake up to the alarm bells going off around the Plan-Et. Call home if you need, make sure you get your one phone call, and right if arrested or in plight. Do not give up any more rights out of fear or fright. Stand firm one for all, all for one. Planetary, Spectral and Cooperation tones will lead to a Cosmic Dance and New Beginnings of how we view the world. Each 7 day week ShirleySienna will tune into the day and kin codes and write a little inspired/channeled forecast to take us through 2019 in blocks of seven which is the divine universal allen key to the Great Mystery and Frequency of Existence. The Great Calender, the Tzolkin of the Maya which explains and pertains to the human development of psychc body mind and soul is now in synchronic unison under numeric law with the Gregorian Calendar of which we of the western world base our days and lives upon. A calendar does not make it right, does not make it so, does not make it all or anything really, it is just a guide to where we are at, what we are doing, the season, appointments and so forth. It has however been set upon and usitlised by industry and power to own your mind, through owning your time. The Tzolkin and other sacred calenders used around the world, are respectful of divine lore, not human law and the standard is of the stars, the earth, planets and all that is created to assist navigate and guide human kind through the life journey, which is why now there is no more real separation. Unification is always the answer. The order of the true lore of Time has begun to show itself more, the veil has begun to disolve and the slide shows morphing together as a fluid, overlapping clear film rather than a set of individual scenes. It doesnt matter where it came from, who put it together or how it looks everything is always under divine numeric frequency order and that will eventually, as is now, stand forward. This unifaction of spirit is the hands, the face, the jewels and the real time-peace of life. Like a wizzbang flash of lightening, things are beginning to lighten up. Enlightnment seems not so far a way, not in another galaxy or universe but deep within the self, just waking up, like the morning sun ready to dawn. Travelling with some better and freshly rejuvinated heart felt feelings, one may skip merrily through April preparing for the month of May. The book of changes will be here soon eneough, just take stock, stay grounded or connected to Earth Mother, for that is the heart of the matter and where heart matters, as Earth is me, you , I , we and us. Sitting in sacred space, you have the ability to go deeper than you though possible at this time, and communication with other worldly beings is on the horizon, sailing closer on the tides of dreaming and sowing the seeds of consciousness, new and as yet unrealised. pulsing, with life force energy, setting intention for the remainder of 2019 is the vibration and power in the hear and now. Hear with the ears of spirit, see with the eyes of spirit and speak with the words of divine intuition and create a portal of connection just for your own personal and special use. You deserve this, it is your divine right. Doing this will assist you in bridging the worlds. This is a 7 day period, of and for the divine chaos of the feminine, make no mistake. There is a Queen in many fairtytale and stories. Women of strength and power often are portrayed as evil, as the stepmother or wicked witch. In comes the too pretty in pink good witch, or theres always the damsel in distress, rescued by the brave knight in shiny white armour. Women are given a vindictive streak from the story teller ( and media). The archeytpe of a powerful independent women comes forth, and everyone prefers the princess whom silly enough to bite off more than she can chew chokes, ( apple scenario) and must be rescued by he who astride his white horse,( would never really get down and dirty on the ground) representing the imaginary but never quite avaialable hero. Avail yoursel, .. ? no , not able ! You have to save yourself. You are not bad, maybe not always good, and maybe like this photo, upside down and topsy turvy seems your world. This spin of 7, takes you flying toward the reflection that Grandmother Moon has held in the wings up until now, and is going to let it rip, like the tides and flows of her oceans. You will polarize in the coming days, and a ripple effect is imminent. This is a good thing, dont worry and think it has to be nasty, sad or bad, it may very well be very nice, happy and good. This is largely based upon your abillity to be the Soul-ar Human. Pulsing in time with the beat of the Heart of the Matter which is Earth. You are spirit walking the Earth, dont forget this, its your Saving Grace. Use the power of intention to set a standard and reflection, and accept willingly the other side of the coing so you get the whole and bigger picture, which will fly in on the wings of the eagle rather than the peaceful dove, but you will skip like the warrior down the path, or rather the 'yellow brick road'. So cllick your heels, as the Red Earth Wavespell is coming in, and then you will see- what you least or most hopefully expected, and maybe even bargained for. March will give way, think on your feet, let imagination be your guide, visualise, word, draw,d paint and create quickly. Apriil wants to bring things into form and you may trip on the rug or bumps in the road if you dont realise its all just reflecting the illsion you are under, we are all under, .. for we all agreed to see, and the greed part has taken over and caused a fog and distorted image. Oz, or Kansas. Which is real, which is the reel ? 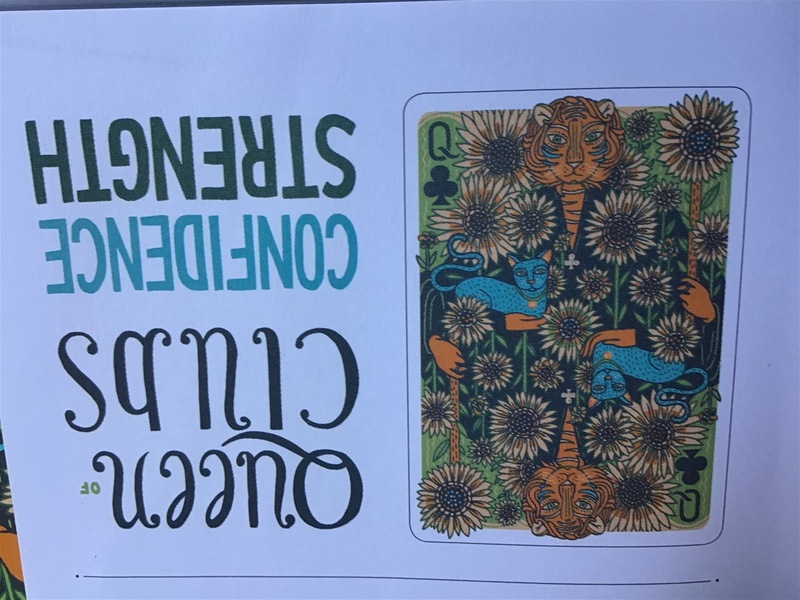 The Queen of clubs Card, ( strong archetype of the feminne revered by some, resented by others), will give you the strength and confidence required if you sit quietly and let her in. Like Quan Yin, shell comfort you and support you. She has magnificent and magical energy and qualities to share. Enter the robe, be nurtured and then take heart and meander or march, down the path, forward movement into much change that is afoot and ahead. As above, so below or in this case, visa versa works, for from the ground up you must envisage and build. The law of attraction will then meet you half way. 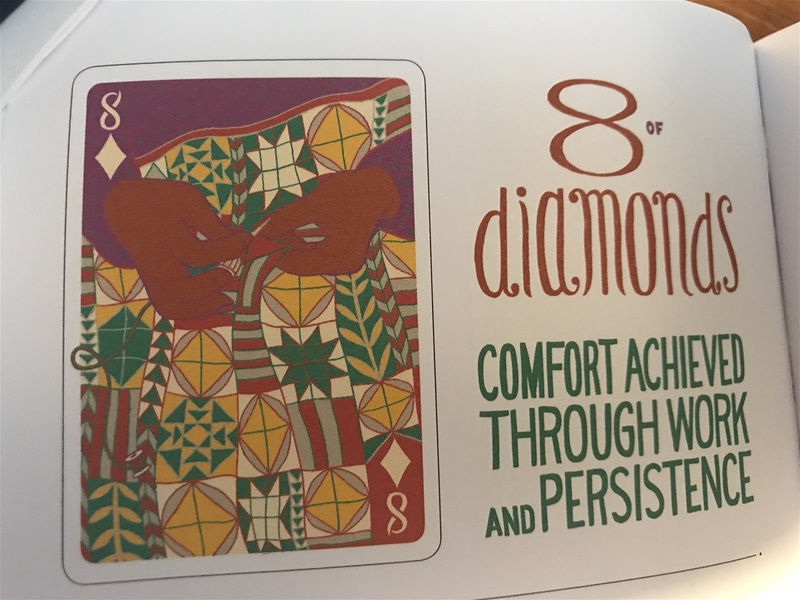 Card: 7 Diamonds-the sTar, Hope and Healing. Lunar Magic, Mother Moon assist me in stablizing my sense of wellness, happiness, joy, and complete being. I Polarize in order to survive, from there I flourish and life force energy prevails and I revell in the lunar tone of challenge, for my greatest teachings, come from my greatest fears, and I realize very quickly that all is good, there is no boogy man, no bad karma, no evil form to get me, only the balance and the way needing to be cleared, releasing from my fog I see the light, I surrender and I am shown the way to navigate toward the Shining star of Hope and Healing. I realise also that all is an illusion, neither good nor bad, just what is and when I accept this, I then see the magic in all that I do, in all that is done, and in all that is. Integrity must guide the way this week, keep ahead and keep up with the pace, dont draggle behind youll only let yourself down. You are fully equiped, just release the old, unrequired, uncompleted, unsavoury un's, and breathe in the fresh new opportunity that is just waiting for you to arrive in its clearing of purifed energy and splendour. Sounds easy, well it is and it isnt. Dont ask how, or why, or when, or where. Welcome the future, Release the past and Embrace the Present. The 11th inspiration. I am writing up on the 11 th of March. This adds to 11/3/2019= 8. 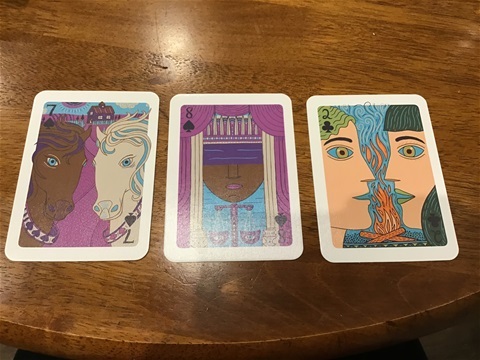 The cards came out as 3 in a row.. I add them.. 7,8,2=8. today is the day of red resonant earth, the 7 keys, and the new spin for the inspirations starts tomorrow.. it will be kin 138 white galactic mirror. 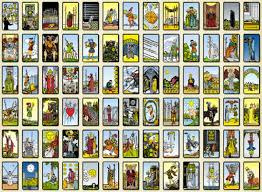 .the 7 chariot of spades..the 8 spades balance and the 2 clubs ..mirrrroring. know that each day is mirrored, each day must be a whole and complete reflection of you and for you. the 7 chakra, radialplasma spin will finish on Monday 18 the March..kin 144 yellow magnetic seed in which you will find you must be guided by your own power double forever after, no going back, no returns only your own path will do. each to his own , each radiating a plasmic hallowed halo and circle of light, as each is a sacred being of divine power. new paradigm another little shift, allow yourself to be lifted, let the soles ( souls ) of your feet be at one with the ground and your finger tips reach for the heavens and touch a star.. I have taken the time to learn and understand and I see way beyond the boundaries of the matrix. I am the synchronist in all ways, in all things. this has not happened by chance but by being in focused, conscious alignment with my path, even though my personal life has been and is more oft than not tough and oft traumatic. Card 7 Clubs .. Vigilance. Struggle to stay ahead. Just when you thought Oh, yay March is here ! this will take me forward on my path, easily and with momentum, suddenly you see the hiccups and hurdles and your tired. Key remembering is in the trunk of the car, you have a spare tyre, this will replace old outworn nuances and get you four-wheel-driving over any appearing nuisances. and bring you to your new-senses. Assistance and help is on the way, as today we enter the Monkey wavespell of illusion and magic. What you say? more trickery on the way ? yes perhpas so, but you will wave your magic wand in the nick of time and with vigilance and clear vision, see past the illusion and understand that perspective heals all wounds, and until we have to journey past our own illusiory affairs, we see no truth and remain trapped in thinking life is too hard. Enjoy the hard, enjoy the painful, enjoy the sad, glory in it and say thankyou. It will do you well, as you must know you tend to feel those things more than you do the easy, happy painfree. Those you ignore way to much, so not so much growth there. Dig yourself a hole, and dive in. The earth is there to give you comfort and revival of spirit. Make that hole a sacred nest, closest to the heartbeat of divine Terra Gaia, back to roots, maybe like the beaver pictured in the tarot card, eath those roots, chew away, ponder, see and finally aha! 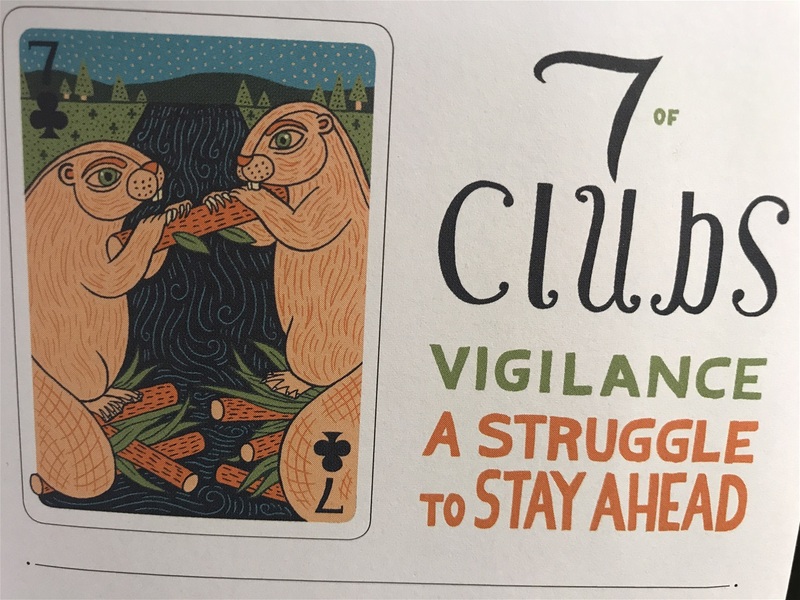 A struggle to stay ahead, as the 7 of clubs says, means I must be going the wrong way ! Why do I need to feel that vigiliancde and beeing ahead is the right thing for me now, when I just want to cosy up in my hole and recieve the comfort from Earth ( heart). This time, March is bringing the pillows of comfort if you give yourself time to rest and evolve. 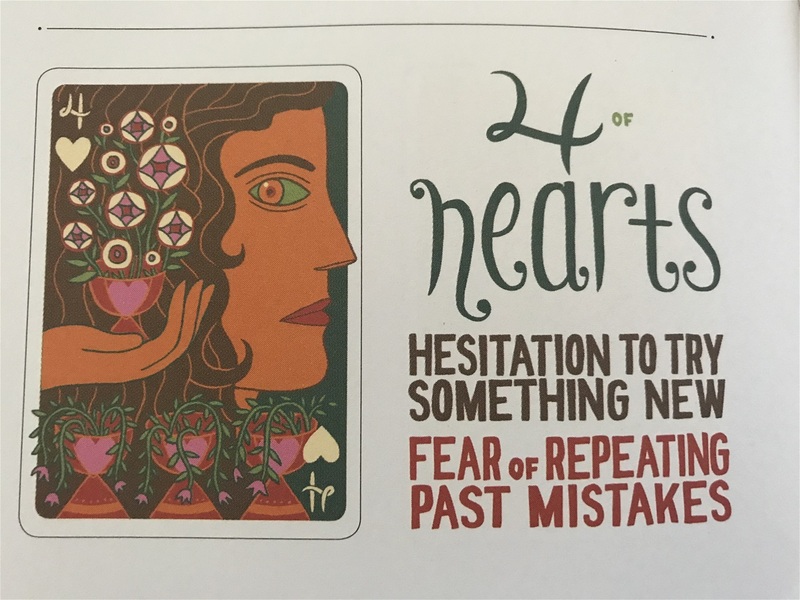 Self love, nuturing and health improvements ( yes via a struggle and vigilance) will keep you still enough that the turn of the earth, the natural movements of her time and frequency will take you ahead of the rest if you let thing happen. Mid way through the month, will you be half way up the hill, or half way down? Maybe dont worry so much, good times ahead, see the good in this time. Dont build a dam, dont give a damn, let everything just flow around you and in your own good time, you will find your way, with the current and end up just where you ought to be. This 7 day spin, is spiraling through to a cosmic conclusion. dedication energy and focus is key point here and the universe will do all within ints power to present, point the way and it will persist where you may give up. It heralds in responsiblity for personal empowerment. Beginning, by sowing seeds with the keys available and ready, you can plant them along the side of the path your drawn to travel, albeit maybe hidden in overgrown weed, there is a way, and it will become clear if you veer a little to the left, a little to the right, jump over a fallen log and trust. Just remember to sow seeds along the way rather thank dropping breadcrumbs. drop your crumbs, others will pick them up and run, sow the seeds and the you shall reap the harvest. By the spirals end, you will have created a new pattern in the Maya, the complexity of the weave, youll just be stitching up some loose ends, no harm done, on reflection no loss that hasnt brought you gain. The satisfaction, pleasure and reward is there. Loyalty, love and a sesnse of accomplishment. be guided by the power of timelessness, the wizard within. New adventure coming up, a job well done, you will see the bigger picture and a finished product in your near future. let despair fly out the window and be prepared for some cheeking incoming magical moments to ensue. Right off today, I realise this message is very much for me, and just as much for all of you. Last week, we were offered keys, in the 7th inspiration, this week we are asked the question, “did you take the key, did you use the key and did you understand what the key was to reveal”? Well in hindsight I certainly took the key, I used it and as the 7 day spiral closed I began to understand very clearly what is meant, for me! 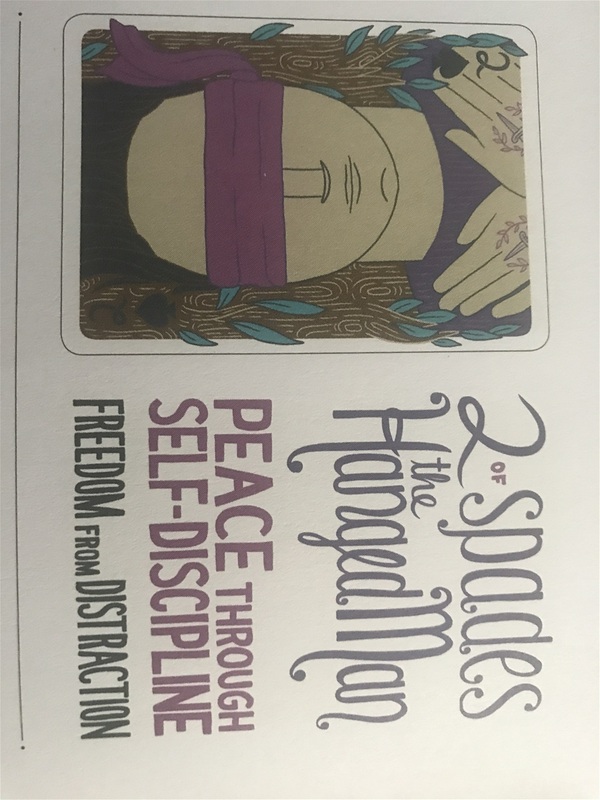 Starting today, I am thinking processing and knowing I have to turn the key that is the burden of responsibility around and take charge of situations that affect me or have an effect on me, and clearly make and state my boundaries. Make them with love and highest vibration and intention so that they do good for all involved and around. 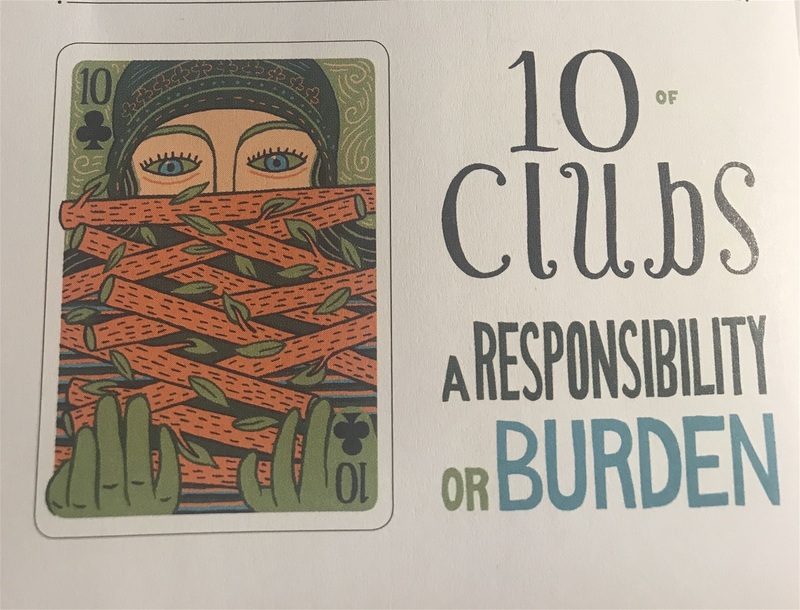 There is also of course the difference between a responsibility and a burden, choose to take on and realise responsibility for that is of the self, the burden means it is of another or others. 10 of Clubs, my personal destiny wheel card, means turn forward, movement, leaving burdens and honouring self- employed and self- enjoyed responsibilities for they are my choices, if not feeling the joy, once again I say it’s a burden not a responsibility. I’ll play a little on the codes of the date and kin. 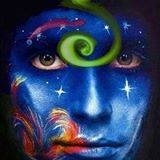 Today is the first of the new 7 spiral, the kin days in their usual order as they are synchronised, we humans moving on the planet in today non synchronisation, disharmony and distain. This day, 19/Feb/2019 counts as 1,2, 3.. 19 is 1,Feb is 2 and 2019 is 3. I feel that we are moving into a resolution of some sort because the ending spiral kin day, on the 25th Feb 2019 is Kin 123 Blue Rhythmic Night. This tells us quite simply if I put it all together, ‘follow the synchronistic trail, find YOUR way, there is only YOUR way, cooperation but not servitude and sacrifice, those days are gone, taking you along a path where you have a real-I-zation that to bear the 10 of clubs, is the energy marker given to say I am the energy and only energy of my life, my time, my space and my person and what I make of it is my personal responsibility, I do not need to bear the burdens placed upon myself from unwise choices and sacrifice, I want to move forward with ease and grace and be a joy unto myself and others. My joy, ignites joy in another, my misery turns them away and I become alone, still carrying the load that I do not know how to put down. This week will give you the armour and strength to speak and act according to your truth, into a moment of “it’s as easy as ABC, 123, or as simple as do-re-mi”! Blue Rhythmic Night allows you to turn everything into a harmonic convergence of simplicity and self, and is the dreaming and allowing of the turning of the wheel of abundance and supply. O My! I am open and receptive to my fortuitous future, I am in rhythm and balance with my destiny wheel and the energy of clubs are 10 fold and fortunate. I let go with love all that is not mine, and love all that is. 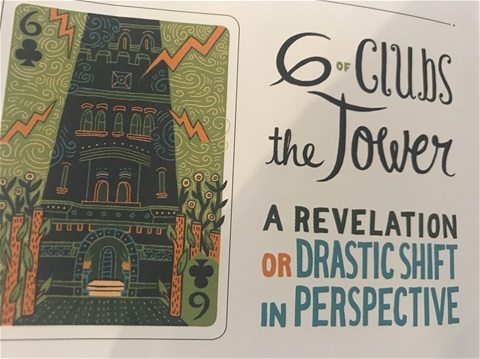 Card is 6 Clubs: The Tower, A Revelation or Drastic Shift in Perspective. What I say, think, feel, sense and write is all part of the messages coming into me, and from me and all around me. Same for you. We are travelling the wavespell of the serpent, shedding the skin, parts of you and your life that are no longer valid, and seeing situations from a different and hopefully higher perspective. 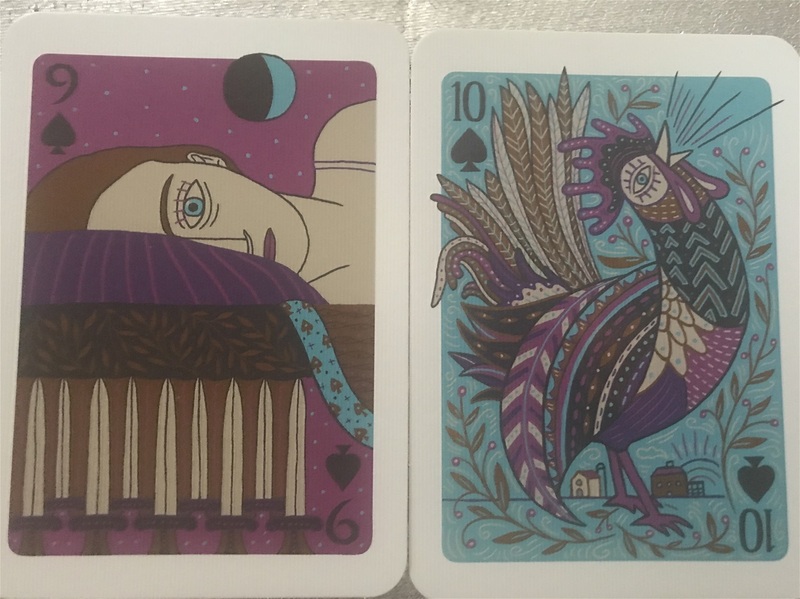 Kin 110, 12 Feb 2019 sets a standard you may wish to uphold, for down the track a little this standard will be what is holding you up. Set it well, with firm intention and make doubly sure you are coming from a place of LOVE. 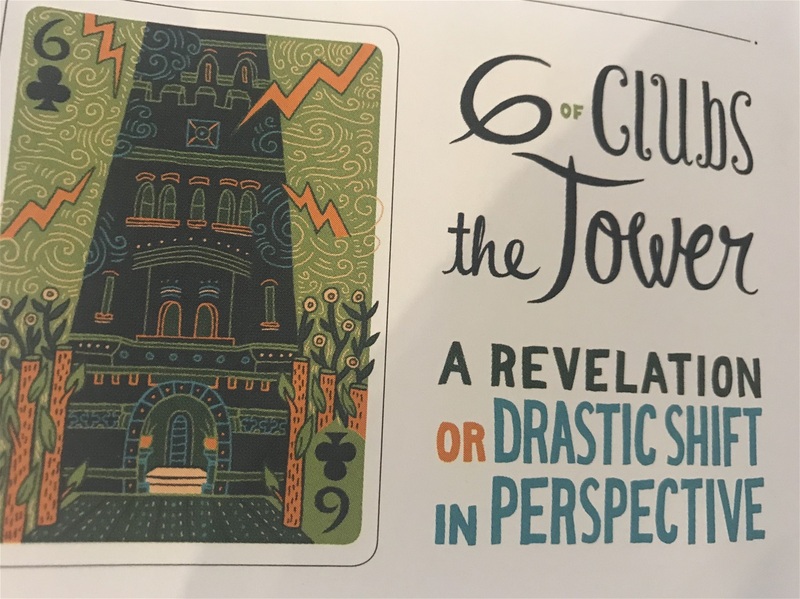 The doorway is open and you may want to exit the falling tower, allow it to crumble and understand that you have begun the demolishment of the illusion that you are not worthy, that you are not loved, that, you have no power. Ground Zero, allows you to fly and land safely in your own chosen place of pertinence and persistence and presence. Journey well and allow each day, each colour of the chakras, each spiral of energy that reveals a new doorway each sunrise to the next to be filled with the innate ability to heal your life. To Meditate, Contemplate and Create. You are the fearless one, you have made a clearing , by allowing that which is unsafe, unsuitable and unsteady to crumble. Sacred Space to rebuild, after clearing the debris and honouring the journey thus far. Read the previous spiral of inspiration, for the final day of white spectral wind may breathe some communication, insight and freedom into the mind preparing you for the next round of 7 keys of mystery. Each day, each chakra, each spiral of 7 is a divine mystery and code. Perhaps this post will inspire you to dare to dream, to communicate to and with the divine energy that exists within and all around you. You are the piano, the chakras are the keys, and your soul has a tone, a note and a song line that circulates with the meridians of your body. Everybody has many ‘bodies’. We are a body of water and we have mental, emotional, etheric, bodies interdimensional and interacting on a multitude of levels. Don’t worry about it, just be aware of what inspires you and ask your guides to bring it in to your dreaming. We are the dreaming, we are the land and the skies, above and below. Bringing heaven and Earth into the ebb and flow of our awareness. 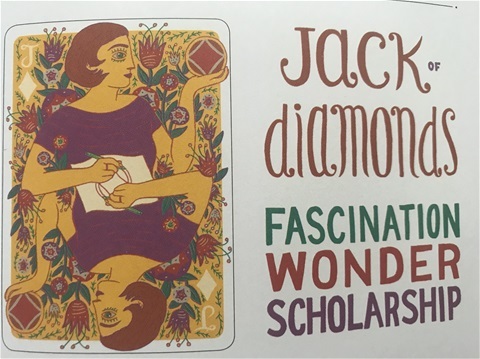 The card that was drawn, is the Jack of Diamonds, and yet it shows the woman pen in hand. Notice she wears a ring. This is symbolic of being wedded to the self and acknowledging the spirit of oneness, the connection of all souls. 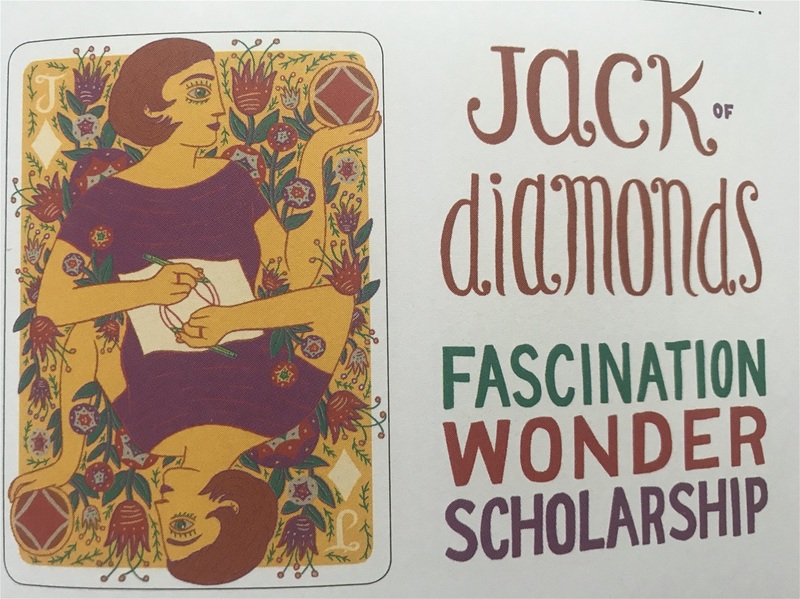 The jack of diamonds is youthful energy, and will give you the zest you require in order to fulfil your dreams and aspirations. As she writes in her journal of dreams, she draws symbology to bring imagination into form. As we set off on the next 7 day journey, Blue Crystal Night, encourages us to fully cooperate with our intuition and be the correspondent of our own dreams. What you imagine will come to pass, therefore it is important to edit and take note of your thoughts, wishes and intentions. Vision and free will must align for the highest outcome to occur. Be wary of what becomes manifest. Lessons and blessings come as 'blessons' in every way shape and form. Sow seeds of love with every idea and allow bridges to be built, offer a hand where needed, and understand that everyone is a self-existing shiny star, and beautiful in their own way. Then healing begins. Empowerment and flowing frequencies of introspection and personal connection radiate from within us. We are like beacons of light bobbing about on the ocean, guided by one another as we navigate the universal waters of life, humanity and consciousness. Don’t just survive, use your life force instinct in order to thrive. For your personal updates and insights please book a consultation or reading with ShirleySienna at Divining Me. Kin #96 Yellow Overtone Warrior to Kin # 102 White Spectral Wind. Be aware that change is night, the humans are stepping into rightful play and what is and who has the power? Let falsity and illusion fall away, change is the new direction and Overtone Warrior empowers in order to question. Altruism in highest order hidden beneath vain imaginings, waiting for the debris to be cleared. Without fear, go forth with intelligence and the radiance of all that is supporting you this week, and the seeds sown will flower, as you travel through the 7 chakras and plasmas of radial enlightenment. The doorway is open, the gate is for all to step in, and for those that need assistance help is nearby, be brave enough to ask and receive and wise enough to see the forest through the trees. A firm branch will give you a staff of wisdom and aid your steps, and clear away the bracken, ignore the sullied waters, there is a clear spring not to far, but far enough that you may feel you are at the end of breath, and ready to dissolve, which is the purpose now. The numbers 6, and 4 play strongly people coming together, supporting, endeavouring to create new foundations and his/herstory with mind of liberation and the inspiration of worlds beyond rallying all the way, until you find yourself so powerfully aligned with your own intention it feels as though your power is doubled. Kindness and trust are keys for this 7day spiralling path, the warrior becomes the wind, becomes the divine breath of spirit and in-between the archetypes play the game of thrones. Earth, Wind, Rain and Fire bring forth the radiance of Solar Tones and Reflection allow the birth of new ideas, insights and with the power of manifestation working within as 101, healing begins on a planetary level. Follow the stars they say, but please remember you are under the full persuasion and spectrum of the Moon. Old grandmother moon, for she is totally divine. Her ancient femininity is in perfect alignment with the date of 22 January as she sways the tides of our emotions. The goddess/chaos/that 22 implies and impacts wholeheartedly. 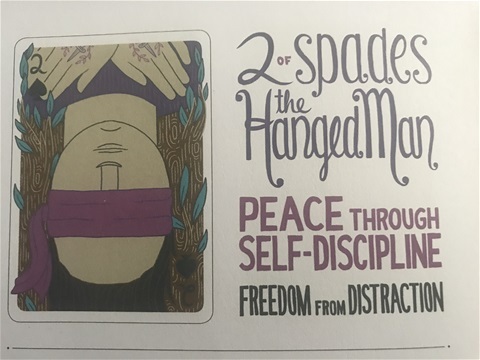 In order to dissolve and purify ourselves, rid ourselves of old pent up emotive and insecurity the freedom of the Spectral Moon tone beams down , liberating us and giving us no choice but to follow the power of our instinct, and own desire first and foremost. The hUman within, filled with love, and the consciousness wanting change empties the buckets of old tears ready to make a souljourn down the windy 7 day path to broader horizons and landscapes of perspective before unseen. By the time we come to energy of self-reflection on the 28th January 2019, the 11 spectral tone has unified itself with its yin/yang counterpart number 2 (11) and the Eagle of the 4th tone, has taken to the skies as foretold in the previous weeks inspiration and discovered it does love itself, its own energy, its pure unadulterated vibration and its droppings are seeds of kundalini power and expression, ready for the joy of discovering new ways of being, seeing and doing. The output of new vision. Like magic beans, the seeds germinate taking us to the land of the unknown mystery that right now we can for the first time ever begin to envision, Seeds sown in order to create. Two cards fell from the deck of illuminated tarot today, 9 of Spades. What has been keeping you awake, and struggling to make sense of, in the moment, simply dissolves. 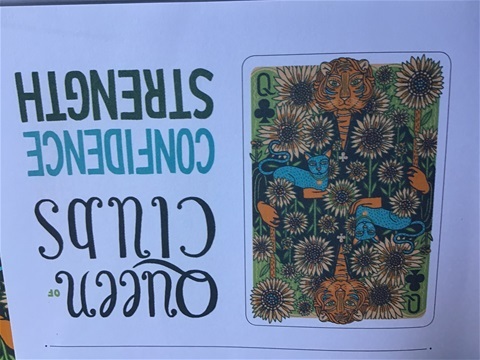 ( which if you notice holds the world love within it diss-olve-s), and the 10 of Spades, judgment becoming discernment, as you awaken to an announcement of your own making. I am guided by the power of magic, I am self- existing. What is Freedom and Liberation? What is my vision? What is this magic I am guided by? I am beginning to be aware now of my own power, to see past the illusion of despair and release all old worn out ways, in order to see the spectrum of a positive, possible, viable future and I Know all that happens is for my highest good. The universe is working for me, and with me in all things and I see now that the way is a multiverse of possibility and scope. This creates the vision of self, in order to raise the vibration of all. When we think we are being controlled by others, their situations and circumstance, this is the Devil in Disguise, for it is merely and only the reflection of our own need to control. Surrender all that is beyond your grasp, and release that which you have managed to take hold of. Let go of attachment to the outcome of all, how, why, when and where. If it is or if it is not doesn’t matter. Free yourself from the chains of others and revel in the purity of realizing your own self. Don’t let the devil tempt you, instead bless him to fly on angels wings, in the wind of kin 82, White Self Existing Wind, master of my own voice. 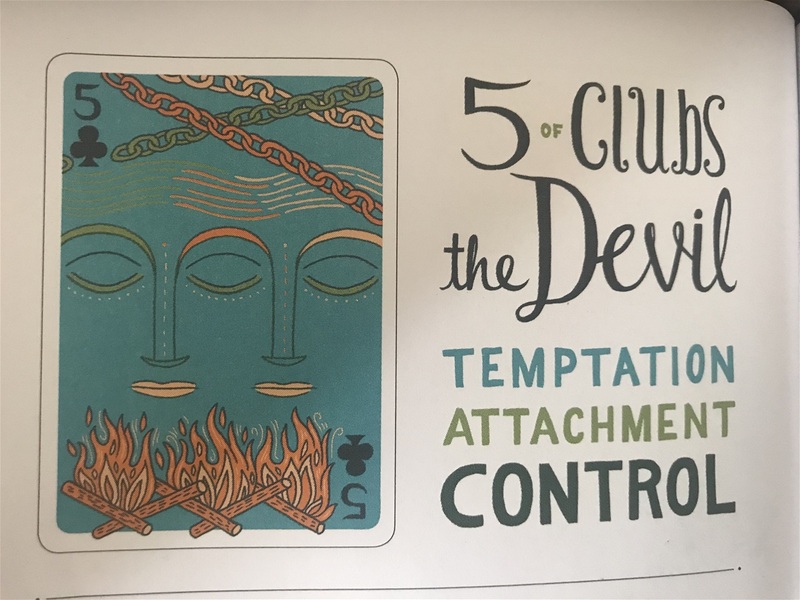 Surrender and then simply communicate in a few words, to another party, or simply to the heavens, with the inspiration of spirit and the breath of your own divine tone, it will be guided in the right direction if you open your hand and let it go. 7 days hence, a whirl of plasma, mastery and magic will have created new beginnings, new circumstance, new ideas and ways of feeling and thinking. Unity and love are all that matter, band to base all you create from these two things, shows you are guided by intelligence, higher mind and are allowing the instream of the spirit guides of the galaxies to influence you. It means you are connecting deeply inside of yourself, and being at one with the universal order of flow, of attraction and of all that is. This may bring tears, feelings of grief, aloneness, anger, puzzlement, but lead toward calm, forgiveness and clarity. Addiction is filling the wonderful void that awaits the connection to self, with that of others, things and illusion. Clear as we traverse the Blue Storm wavespell. The days of the calendars have become one, for the lore of attraction says, no change will come without unity that all consciousness is as but one. 15/1/2019 is 10, The Power of ONE. 21/1/2019 IS 7, Allen key to all that is. Kin 88 is 7, keys of unity, the Planetary 10th tone, brings all into manifestation. 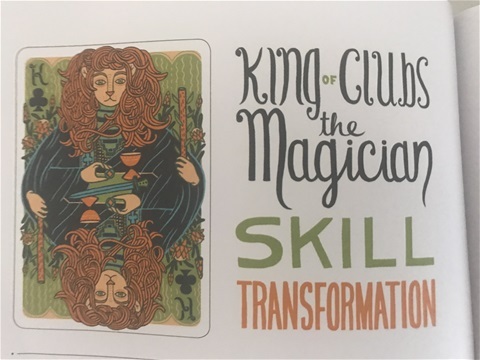 Card is King of Clubs and the Magician. My job is to explain that which I see as a synchronised part of a greater whole. I will neither fully explain nor adhere to set formula, for this is the time of true synchronisation and the time I have been waiting for. It is the time you have also been waiting for. This time frame of consciousness is programmed to jump start you out of that old sensory perception and into the less common and less understood which makes much more sense really. This is the time of paradigm development and a higher frame of mind now calling the shots. This 7 day period is like a cannonball full of ‘shot’ that is heading straight for you. It won’t hurt a bit. You are the eagle on the wing and of planetary alignment which is full of ideas, creativity and manifestation that could bring, if engineered properly abundance and vision in all sorts of forms. Think out of the square and into the cube. Multi-dimensional selves to the fore. A little freedom and cooperation and cosmic thinking will offer some brand new highlights and possibility and if you are prepared to build, then what you seek will not only be seeking you but will find you and plug you into the greater order of divine possibility and from a thought, an idea, a single inspiration , will come full throttle the ability to be of service, to provide , to logically with sixth sense ability follow a path that gives birth to gut instinct and awareness, long forgotten to human kin, and ready to emerge activated and with a force unheard of since the days of the dragon. Primal force is ready, to be of service, to think freely and create. It does not need to be huge, immense, or bigger than Ben Hur. 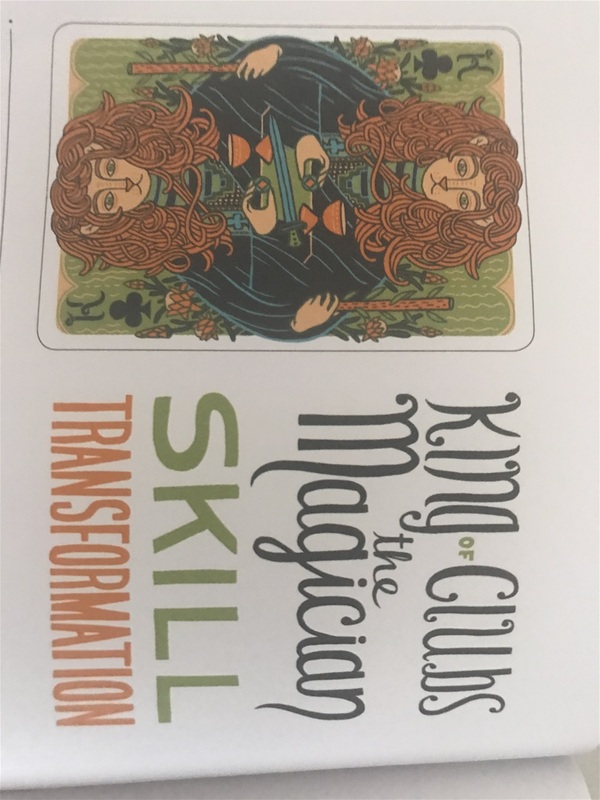 Your chariot is your own, and with energy and dignity, the king of clubs, shows the skill of the magician and the transformative power now being offered by the universe. This may set the ground stone and pave the way for your life now, with under the power of new beginnings and heading toward a bright future. What is not required will shed, the communication, the knowing is coming. Number codes are 3 and 9, both of the psyche, psychical, mental and spiritual plane of existence. The 3rd dimension now lifted by the lords of time and karma. karma is 'a mark' in time. Time is what is used to 'emit' tone and frequency to us. The days of all calendar type are now synchronised, cogs turning perfectly. These consultations can be in person, over the internet or by email. Doorways of opportunity are given this week as we enter the beginning of Mindfulness and Matter. 11:11 has come to play today with the date being 1/1/2019 and the magical kin day of #68 ( Yellow Electric Star) both giving us a vibration of 5, creating 55, which is new beginning under the power of creation and change and dare to dream, forward movement from her on says that we have the opportunity to grasp the grand staff like Moses, part the waters and step into the promised land. Stepping consciously day by day down the mystic 7 day corridor to the first actual doorway, entrance, or gateway See it as you will because on the 7th Jan, 7/1/2019, the first solo 11 vibration of frequency that heralds the Angels singing the ‘Noel’, means that we of Earth have somehow in our own ways heard the clarion call and the universe has thus delivered to us a new mode of thought patterning beaming in on a channel personally attuned to you, the 7 and 11 antenna key of deliverance. Open your mind to that which cannot be explained, seen or given outside of yourself instead simply accept, feel, and know. The matter of mind-fullness is Santa’s sack of goodies ready for you to partake after all this celebration, and each day to the 7th is a gift. 7/1/2019 is 11 and Illumination from the inside radiates to the outer world if you let it. Does it matter if things are different, and some things no more? Let it be, as other things will definitely become a lot better. Today, New Year’s day is kin #68 Yellow Electric Star and it gifts you the activation codes necessary to beautify your life and bond it to your inner store of elegance for good. Plug in, to the mother board of Gaia-Terra and be of service in order to discover your purpose. Your purpose, that gives you light love and illumination, higher mind, and because you are made of the matter of the stars you have today the power of free will at your creative fingertips, the consciousness of the Great Order of Divinity awakening in your mind and its plugging itself into the heart space and giving every single person on this planet the opportunity to equalize from the empowerment of personal surrender into love, sow the seeds of love, embody and display the love and that is all you came here to accomplish. By Monday, 7th January combines with the kin code to bring into physical reality the double 11 code of 11:11. The base component. Chaos may be the harbinger of new foundations, that is creation with full Godd-Ess (22) Impact. The kin day #74, White Solar Wizard, says welcome to Oz, enter through the double door, you are the code, you pulse in order to enchant, and you will realize the receptivity and timelessness that is yours by divine right. Set you Solar (Soul-Are) tone of intention and be guided by the power of your Earth-Heart. Number and Kin explanations below. 7th Jan 2019 is 7 plus 4, a hidden twin of the kin day code which is #74 giving a very interesting frequency of 11, and of course creating the master Goddess code of 22. With a little tongue in cheek let me say, that it takes 2 x 11 Divine Masculine Frequencies to equal the power of the Goddess frequency 22, and we could say that is why we have the battle of the sexes and a lot of 3 dimensional old paradigm male vs female roles being played out. Eg: pay levies, standards of behaviour, overpowering and violence and why war and invasion abounds on earth. The inner masculine using its power unwisely overpowering instead of empowering. May this new paradigm, show us that double masculine creating the feminine form and foundation on earth is the show of true inner strength and that mutual support and equality will bring forth the new earth. No going anywhere, forget Mars, leave space alone our job is here, soon we will all return to the consciousness and realise we are SPACE UNIVERSE AND ALL THAT IS. For more explanation of your personal numeric and kin codes ShirleySienna at Divining Me is available for personal consultations. In person, email and/or live internet consulting.